80th Birthday Banners - 20+ Banners and Signs Perfect for Anyone Turning 80! 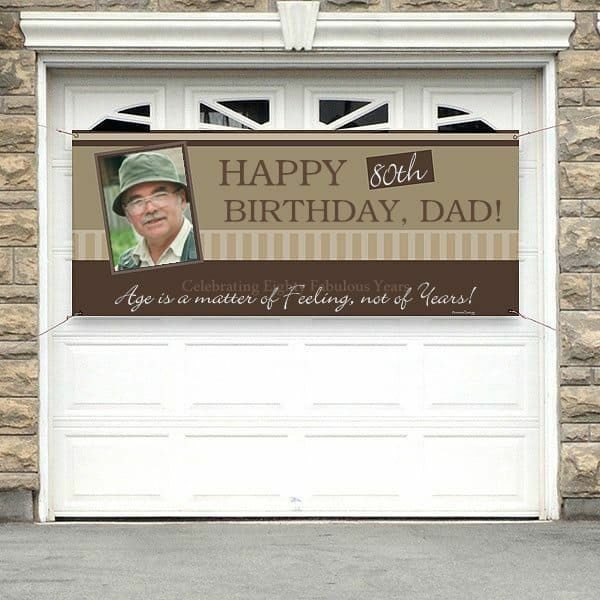 80th birthday banners are the easiest way to add excitement and flair to any celebration! 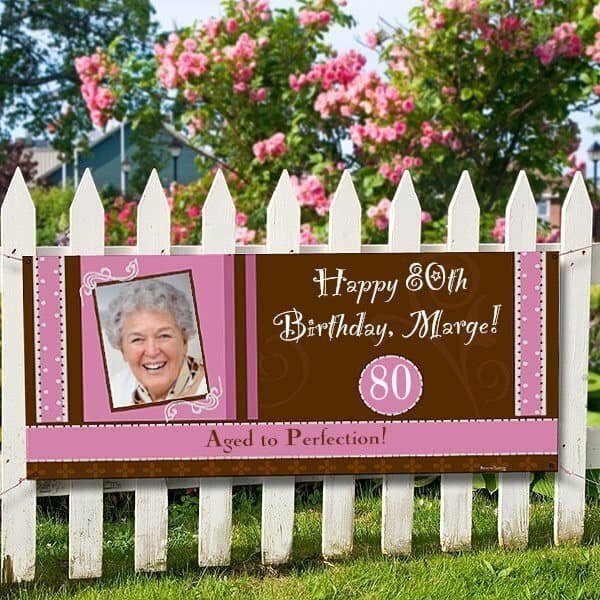 Our selection of 80th birthday banners includes ones you can purchase online, as well as templates and tutorials for making your own banners at home. This personalized banner from Shindigz is a fabulous way to show how the guest of honor has changed over the years! Available in your choice of 7 sizes (with prices starting at under $15), you can add 3 of your favorite pictures of the birthday man or woman at different ages or stages in their life. Customize the text with your own birthday message – you can even change the text color and font if you’d like. A sure-fire attention grabber for any party! 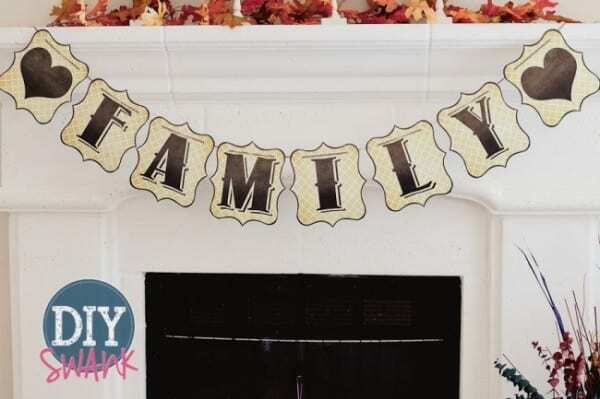 You’ll find banners in a wonderful assortment of styles and colors, so it’s easy to find a banner that matches the colors and style of your party. It takes just a few seconds to change the text to whatever you’d like, but you can also change the colors, size and font of the text if you’d like to get fancy. Their prices start at just under $15, and the banners come in several different sizes. You can even order attach n’ go banners that will stick directly to the walls – no string required for hanging. This striking banner from Personalization Mall is the perfect way to greet guests at your party! The 6 feet long banner is perfect for hanging either indoors or out; the metal grommets make it easy to hang wherever you’d like. Just upload a favorite picture of the guest of honor, and add any 4 lines of personalization to create your own 80th birthday message. A very affordable (under $5) and colorful way to add a Happy 80th Birthday message to your party! Jointed metallic 6′ long letter banner looks great with almost any color scheme. Depending upon the party set-up, you might prefer to use a vertical banner as a party decoration. A vertical banner would look great next to the gift table, at the entrance, or on a wall. Shindigz offers over 150 vertical banners that can be personalized for this special occasion. Each of the banners comes in 7 sizes, and prices start at around $15. Delight your favorite senior woman with this fun and festive personalized photo banner from Personalization Mall! The cheerful pink and brown design announces her special day in a feminine style that’s sure to draw attention. Her age will be printed in a pink circle, and you have 3 lines of personalization to create your own unique message. The heavy-duty vinyl banner is perfect for inside or outside use. Love the casually elegant look of bunting banners, but would rather leave the work to a professional than make it yourself? 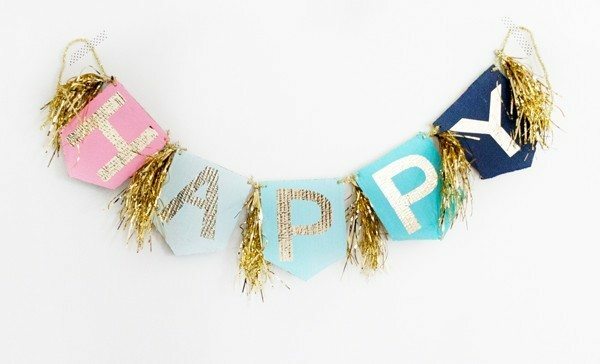 Check out the gorgeous selection of personalized birthday bunting banners at Minted. They offer over 35 different designs of bunting banners in round and pennant styles. You can even choose to add photos to the banners – what a fun way to highlight the changes in the guest of honor throughout the years! They also offer matching party supplies such as table signs, table runners, wine glass tags and more – which is a great way to make sure that your party color coordinates perfectly! If you’re the creative sort, or would like to a bit of money, you might consider making your own birthday banner. 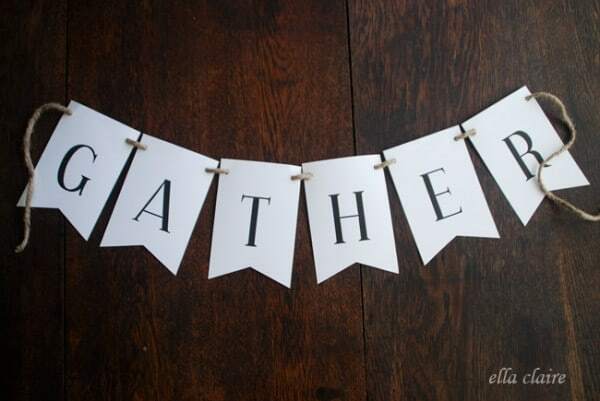 Making a banner at home allows so much flexibility – you can use any color letters or paper to match your color scheme. You could even make the banner out of fabric if you’d prefer. Making a fabric bunting takes a bit longer, but you might find the results to be well worth it. And don’t forget that you can change the way you attach the letters together. Ribbon, twine, jute, or tule fabric are just a few of the options. You can also size the banner perfectly to fit wherever you’re planning on using it. Check out these great ideas and tutorials from around the internet for inspiration! 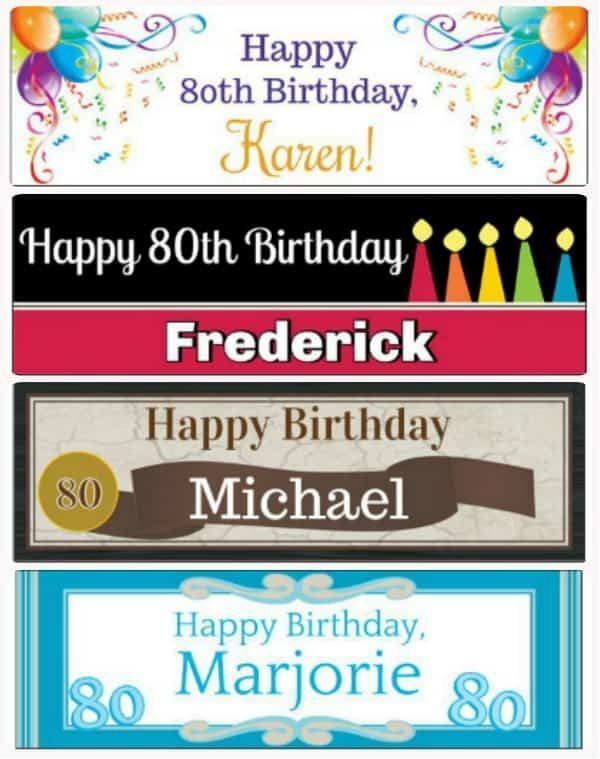 Here’s another beautiful selection of free printable letters that you can use to design your own 80th birthday banner. The vintage styling of these letters is perfect for almost any celebration, and Christen at DIY Swank has included all the numbers, as well as a heart, star, fleur de lis, and other fun symbols. Tip: Use clear suction cups to hang a banner on a wall or window indoors – they won’t leave holes in the wall! This is a bright and fun banner that can be customized to match your party colors and themes. The fringed garland separating the letters adds a festive, glittery touch. The instructions at BHG seem a bit overly-complicated to me. I would probably use card stock in a fun color or pattern and self-adhesive glittery letters, which you can find at your local craft store. You may wish to bring a permanent marker or two, and have guests sign the banner – it will make a great keepsake for the guest of honor! This is a great tutorial on how to quickly cut out pennants for your banner using just card stock, a ruler, pencil and scissors and a paper cutter. You can get 3 pennants from 1 sheet of 8-1/2″ x 11″ card stock. 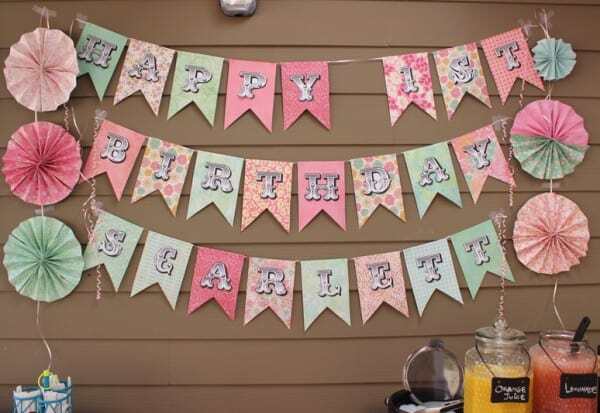 Then just add any embellishments you’d like to create a custom birthday banner. Mix and match different scrapbook papers to create this fun look! No need to worry about coordinating the papers – most craft stores such as Michael’s and Joanne’s sell pads of coordinating scrapbook papers (be sure to use the 40% off coupon). You can find directions and get free letter printables on SohoSonnet. Unfortunately, she doesn’t tell how to make the darling paper flowers, but there’s a detailed tutorial at The Craft Patch Blog. You could also use glitter rather than confetti for a slightly different look. 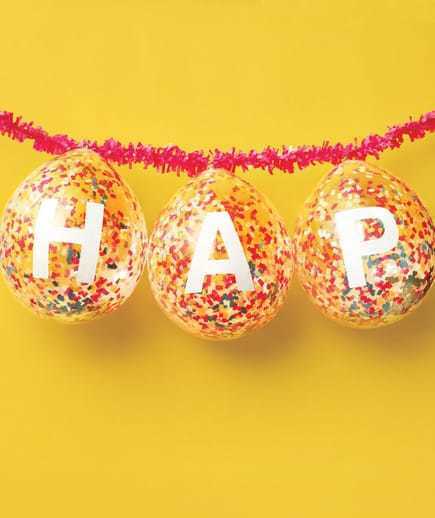 It’s much easier than you might think (and I love the idea of adding glitter or confetti to balloons) – especially since you use stick-on letters to spell your message out. 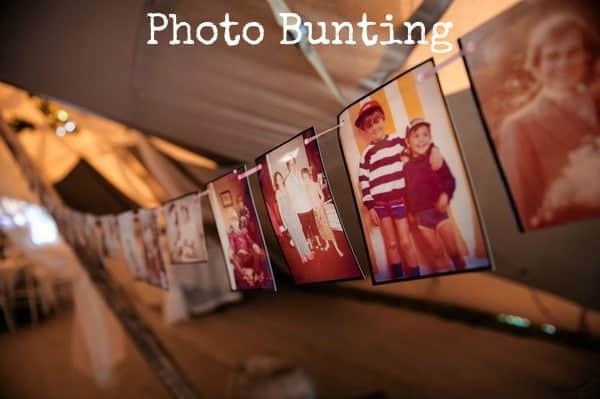 This delightful photo bunting from Boho-Weddings is such an easy and affordable way to showcase photos from all stages of the guest of honor’s life. The hardest part will probably be gathering together and choosing the pictures, but once you’ve printed the pictures, making the actual banner is easy peasy. Vary the ribbon color to match your party’s colors. You may wish to make several different banners to hang throughout the party location, as I’m sure your guests will love seeing all the different pictures! 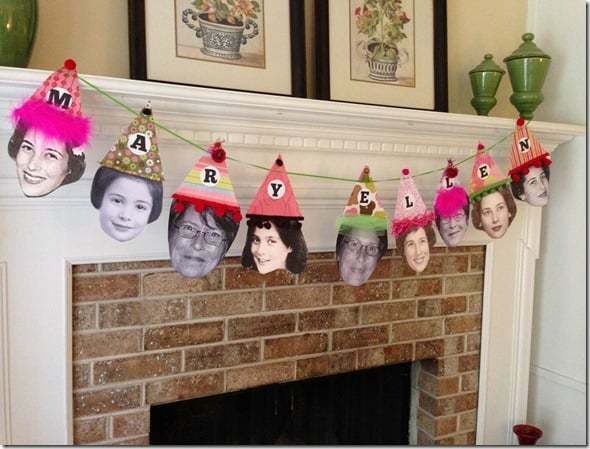 How fun is this adorable birthday photo banner? There aren’t any instructions, but it looks pretty self explanatory. I love the way that each party hat is decorated in a different style – that would be a fun little project to do with friends or family before the party. See more pictures (she actually made 2 different banners) here. Interested in printing your own banner at home? 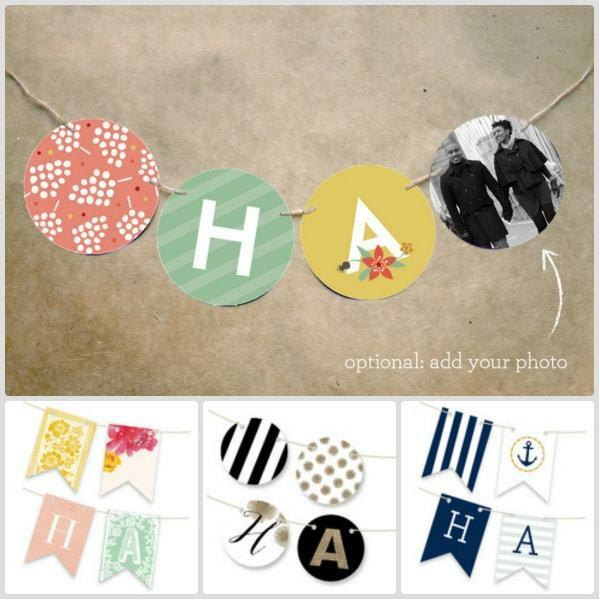 Ella Claire Inspired offers a free set of bunting flags that you can print at home, using any type and color of paper or fabric that you’d like. She also has a tutorial on how to make these at home, including instructions on making a fabric banner. Not interested in printing out your own letters, then cutting them each out? Make it easy on yourself with sticker letters from your local craft store (such as Hobby Lobby or Michael’s). Sticker letters come in all sizes and colors; the glittery ones pictured here add fun sparkle to the banner. See complete directions at Citrus and Cream. The price varies, usually depending upon the size of the banner. Shindigz’ banners currently start at around $15 for their smallest size (54″ x 18″) and continue to go up as the size increases. Minted’s personalized bunting banners start at $28 for 16 flags. There’s an additional fee for each extra flag over 16. How long do they take to arrive? Since the banners are made to order, you’ll need to allow production time – which can run as short as 1-2 days for Shindigz and Personalization Mall. You can then adjust your shipping option depending upon how quickly you need the banner. You’ll get the best price on shipping if you order as early as possible, but order at least 7-10 business days ahead to avoid any rush shipping fees. What’s the best way to hang the banners? Most purchased banners feature metal grommets on the corners, so you don’t have to worry about poking holes in the banner. To hang a banner on a fence, get inexpensive zip ties from your local hardware store. If you’re hanging the banner from trees, posts or columns, use bungee cables or rope. U-shaped fencing staples or nails, are also great for securing a vinyl banner between trees or wooden poles. Put one of the staple inside of the grommet and the other outside of the banner. Indoors, you can always use pushpins to hang the banner if you don’t mind the small holes in the wall. Otherwise use clear suction cup hangers or those removable hangers from 3M that don’t leave marks on the wall. Where should I hang the birthday banner? Anywhere you want a splash of color! A banner hung at the entrance to the party will help guests find the location, and provides a wonderful greeting of welcome. 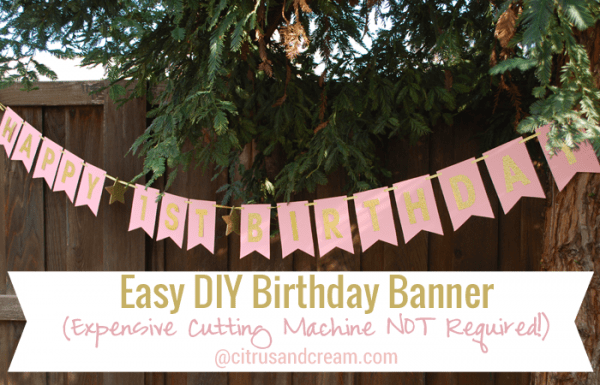 You may also want to use a banner to draw attention to the gift table or cake table. They’re perfect for easily adding decorating any large wall or fence.